Another issue of The New Yorker, another full day reading pleasure. 1. Musical Events: The Wow Factor: Lang Lang and Yundi Li at Carnegie Hall. by Alex Ross. Reading how other people write about music is always an indulgence. The words and phrases sound almost better than the music itself to my ears. This work(BartÃ³k Second Concerto), written in the wake of nineteen-twenties neoclassicism, sparkles with Baroque-style counterpoint and Classical melodic play. Lang Lang, who deserves credit for taking on such non-standard fare, flew through the music with ease, but his touch was too hard. He tended to bang out chords at the end of a phrase, relying on extraneous accents to give shape to a line rather than finding its inner contour. BartÃ³kâ€™s requests for leggiero, dolce, and graziosoâ€”light, sweet, graceful playingâ€”often went unheeded; p became mf, mf became ff. Only in the final movement were he and the composer fully in synch. Grins broke out in the audience during the climactic passage where the pianist pounds the lower end of the instrument in tandem with the timpani and bass drum. Yundi Li is a cooler presence. His playing is refined, almost severe. He has an intelligent way of shaping phrases, controlling dynamics, varying articulations. When Liszt uses the word dolcissimo in the score of the First Concertoâ€”as sweetly as possibleâ€”Li responds in kind; heâ€™s a more naturally poetic soul than Lang Lang. In the concertoâ€™s finale , when orchestra and soloist trade dotted rhythms back and forth, Li kept barrelling ahead of the rest of the ensemble; you wanted him to enjoy these showy phrases a little more, pick up a trick or two from the swaggering brass. Still, it was a captivating performance, the kind that you remember as much for its quiet stretches as for its â€œwow factor,â€ to borrow a term from â€œAmerican Idol.â€ Letâ€™s hope that Li branches out from his favorite Chopin and Liszt. He could deliver a superlative performance of the BartÃ³k Second. The two pianists have a few things in common: both were born in China in 1982; both can execute rapid figuration and double octaves with almost irritating ease; both record for the Deutsche Grammophon label; and both are notable for the variety of their hair styles, ranging from the wavy to the spiky and back again. But theyâ€™re hardly interchangeable. Pop has always drawn energy from the lower floors of respectability; this movie, in which fan-boy cultism reaches new levels of goofy chaos and sexual confusion, draws energy from the subbasement. Noted that thenewyorker.com just revamped their website. I like it much better. At least it is finally making use of the FULL screen! But google wasn’t just catching up with yahoo with all the fancy color/font, etc. It is css alright, but it is dynamic. The background and the entire color scheme of the page changes throughout of the day. From sunrise to sunset, moon rise to moon set. The header background changes, and as the header image gets darker or brighter, the rest of the page’s color changes with it. It is such a simple idea in css. Yet, no one has done it until now. What’s more, in addition to check for your local time, igoogle skin also checks for your local weather! Too bad the bay area is always sunny nowadays. Isn’t that strange? Because i want to satiate my desire to see a stormy header image, I’m now wishing for rain… or maybe i can trick igoogle to think i’m in, say, Chicago? Out of curiosity, armed with firebug, i checked out the actual css. One of the bloggers commented that this seems to go against normal Google design. Colorful photos means more bandwidth/machine resource. Turned out the images were very light weight. Take cityscape for example, the header was a tile that kept on repeating in an outer <div>, and then there is a small gif positioning sun/moon/bicycle on top of the tile in an inner <div>. the gif doesn’t repeat. So simple! yet, so brilliant! Use Gui’s words, they don’t need to bother with weather checking for the bay area. 🙂 there you go, another chunk of bandwidth saved. I stole the tile and gif from their various css files, and built the following test page. Next step is to write that simple onload script to insert the correct css on the server. 🙂 Exciting! I fell in love with SempÃ©’s cartoons back in 1997, when i walked in a reprint shop in Palo Alto and saw this drawing on the wall. It was all framed and the labeled price is over $60. I wanted something cheaper, maybe a non-framed version. But couldn’t find it in the store. I went to another branch of the Reprint in Berkeley, they don’t have it either. After much agonizing, debating whether to buy it, worrying someone might already bought it, i eventually went back to the Palo Alto store and brought it home with me. 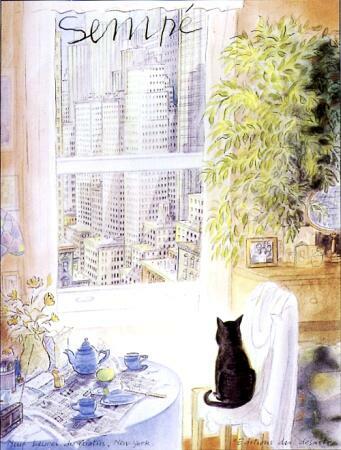 I became obsessed with the artist, wanting to know who he is, why he draw the way he did, etc. etc. At that time, there weren’t that much information about him on line. I tried all the bookstores and amazon.com, trying to see if there are any information about him, and of course, trying to collect his works. To my surprise, there was almost zero information about him anywhere. He seems to only exist when i receive an occasional New Yorker magazine with his cartoon on the cover. So i collected The New Yorker magazine covers. Then last year, when the Chinese site douban.com opened, i wanted to write an article about SempÃ©. Low and behold, i found a lot more SempÃ© cartoons on line. 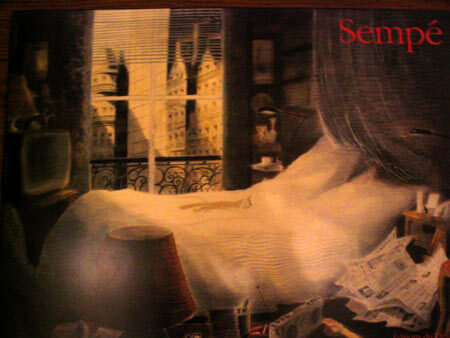 Then i was told there was actually an SempÃ© cartoon exhibit in Beijing! Today, when i tried to search for a particular choir cartoon by him that i remembered from his collection “Musicians”, I came upon this wonderful site that has a good summary about him and lots of interesting links: read yourself RAW – Profile – SempÃ©. 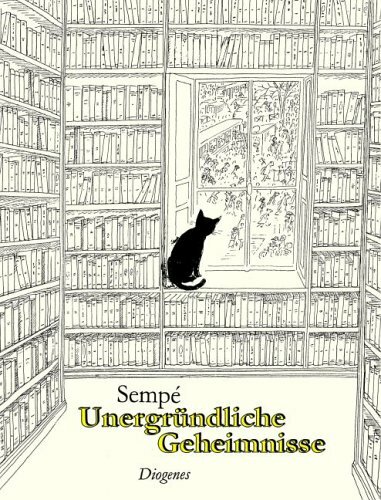 One of the links turned out to be a New York Time interview with SempÃ© in 2006 – Jean-Jacques SempÃ©â€™s Tales of Two Cities! Ever since i upgrade firefox to 2.0.0.1, my bookmark has stopped working twice! Need to remember the fix here. Mi and I hiked Cataract Falls during Thanksgiving holiday of 2004. Interesting enough that I recorded that hike in English, too! Maybe there is something about this hike that doesn’t trigger my Chinese speaking mind. Gui and Matthew went there on a separate trip. We’ve been thinking of going again for a while. In our memories, aside from the lovely waterfalls, there were also these endless stairs right next to the waterfalls that we had to climb. Fear of these stairs kept roaring its ugly intimidating head. 420ft elevation gain within the first half mile sounds near-torture. This year, most of us have been sick throughout the entire January, and hiding indoors through the stormy and cold weather of Febuary. Here comes the first weekend of March, glorious sunny and summer-like warmth. When Gui suggested Cataract Falls on Saturday morning, I agreed to it enthusiastically. We knew those waterfalls would be nice because of the massive rainfall just ended a couple of days ago. But we had no idea how lovely they actually were! There were so much mater pouring down the mountains that the slightest elevation turned the used-to-be creek into a small waterfall. Water was gushing out and around mossy boulders with so much happiness. The real waterfalls were also more voluptuous than we remembered. As always, the path was lush and moist. Ferns were grown into giants, wild flowers blooming quietly, redwood trees at the foot of the mountain were submerged in all the excessive water. It was a popular hiking trail, we met many hikers along the way, almost all of them has a dog or two. And all the dogs are wet and happy. We kept on wondering which fall did the dogs dived under, and whether there are any fish live in the pool below each fall? Along the path I noticed a small flower that seems to thrive to hide from view. 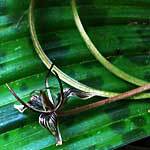 Upon close inspection, it has orchid-like delicate flower petals and an intricate structure. But its leaves look like trillium that you often see in a redwood forest. Gui thought it has to be a kind of orchid. I thought the leaves are so much like trillium, maybe it is somehow related? I don’t remember seeing orchid in a redwood forest before. As we were speculating, I said, well, i could search on the internet when i get home. But that statement of mine reminded me of something more interesting. Isn’t that an interesting perspective? I, for one, hasn’t thought about it that way. 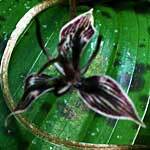 Anyway, back in the forest as we were hiking along the fern lined creeks, our speculation about this interesting flower didn’t go very far. And i had to go on google to find out. 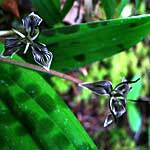 Turned out it is called “Fetid Adder’s Tongue,” and it belongs in the Lily family. 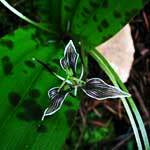 Its official name is Scoliopus Bigelovii, and here is a nice collection of flowers in Mountain Tamalpais: Field Guide to Mtn. Tam.